Wall-vase of lead-glaze earthenware with moulded decoration and glazed in blues, greens and yellows. Pear-shaped rising from a vertical collar on which are attached lugs. 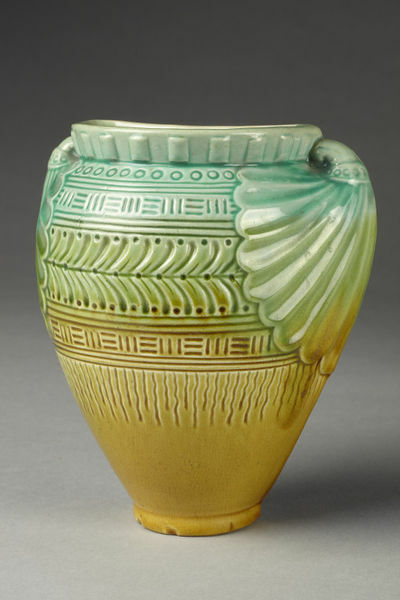 Decorated with bands of mouldings in the form of bands of circles, leaf shapes, lines and squares. From the lugs project leaf-mouldings. 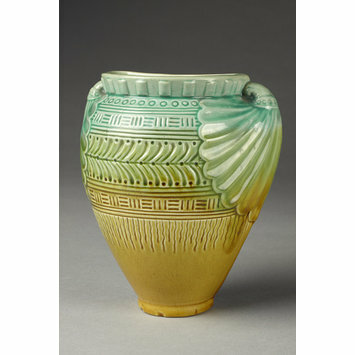 Wall-vase of earthenware with coloured glazes, possibly designed by Christopher Dresser, made by Watcombe Pottery Co., Torquay , ca. 1870.